When it comes to meeting the needs of your workforce, the rugged Wi-Fi MC55N0 excels with its perfect blend of form and function. The MC55N0 offers organizations the right level of features, the right level of rugged design and support for the most demanding business applications anywhere in your facility indoors and outside. The compact and lightweight mobile computer is easy to carry and easy to use, with a sleek design that is at home in front of customers. 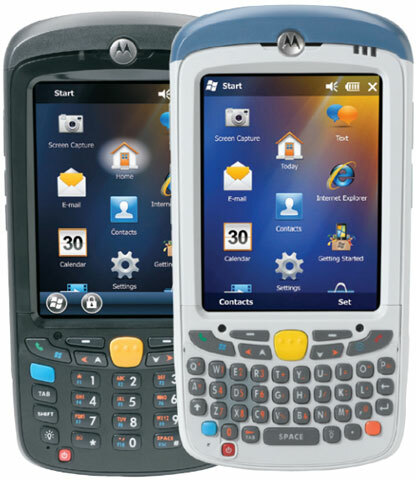 Wi-Fi (802.11a/b/g/n), 2D Imager DL Scanner, Windows Mobile 6.5, 256MB/1GB, QWERTY Keypad, Bluetooth, Extended Battery (3600 mAh), VGA Screen. Interface cables and charging cradle sold separately. Single slot charging cradle kit (Part# CRD5500-100UES). Four slot charging cradle kit (Part# CRD5501-401CES), requires US AC line cord (Part# 23844-00-00R). Wi-Fi (802.11a/b/g/n), 2D Standard Range Imager, Windows Mobile 6.5, 256MB/1GB, QWERTY Keypad, Bluetooth, 3600 mAh Extended Battery, VGA Screen, Color Camera. Interface cables and charging cradle sold separately. Single slot charging cradle kit (Part# CRD5500-100UES). Four slot charging cradle kit (Part# CRD5501-401CES), requires US AC line cord (Part# 23844-00-00R). MC:LP,BB,VGA,256MB/1GB,QWERTY, 6.5,1X. Interface cables and charging cradle sold separately. Single slot charging cradle kit (Part# CRD5500-100UES). Four slot charging cradle kit (Part# CRD5501-401CES), requires US AC line cord (Part# 23844-00-00R). Wi-Fi (802.11a/b/g/n), 1D Laser Scanner, Windows Mobile 6.5, 256MB/1GB, Numeric Keypad, Bluetooth, Extended Battery (3600mAh), VGA Screen. Interface cables and charging cradle sold separately. Single slot charging cradle kit (Part# CRD5500-100UES). Four slot charging cradle kit (Part# CRD5501-401CES), requires US AC line cord (Part# 23844-00-00R). 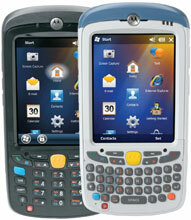 WLAN 802.11 A/B/G/N, VGA Screen, 1D Laser, WM 6.5, 256MB/1GB, PIM KEY, Bluetooth, Extended 1.5X 3600 MAH Battery. Interface cables and charging cradle sold separately. Single slot charging cradle kit (Part# CRD5500-100UES). Four slot charging cradle kit (Part# CRD5501-401CES), requires US AC line cord (Part# 23844-00-00R). Wi-Fi (802.11a/b/g/n), 2D Standard Range Imager, Windows Mobile 6.5, 256MB/1GB, Numeric Keypad, Bluetooth, Standard Battery, VGA Screen. Interface cables and charging cradle sold separately. Single slot charging cradle kit (Part# CRD5500-100UES). Four slot charging cradle kit (Part# CRD5501-401CES), requires US AC line cord (Part# 23844-00-00R). We use these units for inventory. We have older MC55 units but they are so much slower then these new ones. The Wifi seems to get a better signal strength. We currently are not using N protocol but expect to upgrade our AP's soon to enable us to even have better speed.